Kenmare News | Christine is one to watch! Christine is one to watch! Sixteen year old Kilgarvan girl Christine McCarthy, a Pobal Scoil Inbhear Sceine student is an upcoming athlete with great potential and promise. From a very young age Christine has been competing in Community Games, winning District, County and National medals. One of her finest National Community Games medals was in Art. Christine also has an All Ireland Community Games gold relay medal. 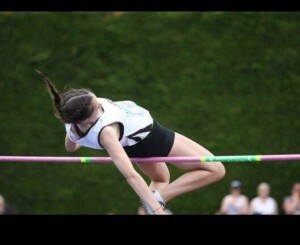 However, it is Track and Field disciplines of High Jump and Long Jump that Christine has excelled in. Being successful in the Kerry underage Championships and School Championships Christine last year won the Munster U15 High Jump Championship and this year placed 2nd in the U16 with a best height of 1.60m. This year Christine won a bronze medal in the All Ireland AAI U16 indoor High Jump which was held at Carlow Institute of Technology. Christine also excels at long jump winning Kerry and Munster Schools Championship medals. Christine’s success at this level has advanced her on to the Munster Elite Squad training sessions which take place regularly at C.I.T. Cork.